The Malaysian property market, which is expected to enter the down cycle next year, will still be resilient enough to survive the onslaught of a softening global economy. The government’s RM7 billion stimulus package, including the reduction of Employees’ Provident Fund contributions from 11 to 8.0 percent coupled with lower interest rate and inflation, would provide the bright spark to the market. The market still has ample liquidity as banks continue to give out financing despite worries about an increasing credit crunch in the US. Association of Valuers and Property Consultants in Private Practice Malaysia (PEPS) president, James Wong Kwong Onn, said although the property market was expected to see a slowdown in the take-up rate there would not be a major correction as there was still room to grow. He said Malaysia was in a better position compared to Singapore, Hong Kong and Thailand which were more exposed to the US sub-prime crisis. “Prices in these three countries have shot up tremendously by 50-100 per cent but in Malaysia, the increase was gradual,” he said. Wong, however, said the association did not expect the market to burst as there would be a moderate reduction in property prices. He said the property market, especially for residential and commercial, has been ’red hot’ for three years up to the third quarter of this year but the softening economy has put a pressure on it. According to Real Estate and Housing Developers’ Association president, Datuk Ng Seing Liong, the property market would see a slowdown of between 5 and 15 per cent in 2009. He attributed the economic slowdown as a dampener to the enthusiasm of buyers. Ng said sales generally would be ongoing but in small volume as most purchasers adopted a wait-and-see attitude while most developers downsized their new property launches for next year. “Prices are likely to moderate by 5-10 per cent from the first quarter 2009,” he said. An analyst from Aseambankers Malaysia Bhd said buyers were holding back their investments until the economic environment was stable. He, however, anticipated home buyers to return to the market in the second half of 2009. “The ’hot’ property items, especially luxury condominiums in the prime locations, such as in the Kuala Lumpur city centre and Month Kiara, would continue to be a focus as demand remains positive. “Iskandar Malaysia is in the limelight. The most prominent developments are in Nusajaya and Danga Bay, which have attracted buyers from all over the world,” he said. An analyst from OSK Research, who also shared his view, said given a huge supply expected to hit the market, especially in the high-end condominiums segment commencing late this year, 2009 would prove to be a year of reckoning for the Klang Valley’s luxury condos. “As the market having to digest the massive supply of high-end condos that will flood the market to at least 2010, this supports the belief that the next property boom cycle will potentially be led by high-end landed properties,” he said. He said the next phase of the property upcycle could only commence in early 2010 or 2011. The establishment of a Legoland Malaysia theme park in Iskandar Malaysia by 2013 will help transform Johor into an international tourist hotspot, local tourism officials and authorities say. 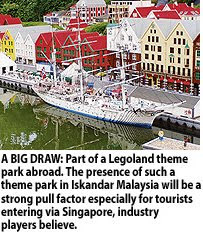 "Having the presence of such a well-established brand name like Legoland sets us in the right direction in turning Iskandar Malaysia into an international holiday hotspot," Johor State Tourism and Environmental Committee chairman Hoo Seong Chang said in a statement yesterday. "This, along with Iskandar Investment Bhd's (IIB) broader master plan to develop a fully integrated tourist hub more than complements our state's tourism objectives and efforts in driving larger inbound tourist traffic from around Asia," he added. An agreement was signed between IIB and Merlin Entertainments on December 13, witnessed by Prime Minister Datuk Seri Abdullah Ahmad Badawi. Kathyrn Lee, chairman of the Johor chapter of the Malaysian Association of Tour and Travel Agents said the strategy will enhance the travel sector's potential and boost the depth and breadth of the travel agency business. Universiti Teknologi Malaysia Faculty of Built Environment and the head of its Tourism Planning Research Group Professor Amran Hamzah said the theme park will be a strong pull factor especially for tourists entering via Singapore. IIB managing director Arlida Ariff said the company chose a theme park that caters to a growing segment of the Asian tourist market - families with young children. "Legoland Malaysia is merely the first of three international theme parks planned for the southern state, under the umbrella of key catalytic projects that will be driven by IIB in its tourism master plan for Iskandar Malaysia," Arlida said. KLANG: Central Spectrum (M) Sdn Bhd, a property developer in Pulau Indah, plans to launch more projects on the island next year as sales have been encouraging. The company, which is developing a 2129.6ha in Pulau Indah into integrated township, has to date developed and sold 1,000ha worth a gross development value (GDV) of RM1.1bil. The township comprises industrial (61%), residential (35%) and commercial (4%) properties. “The Phase 1 of Selangor Halal Hub, consisting of 120ha, was sold to ten investors. The investment value, including land, buildings and machineries, will be about RM840mil,” said general manager Roslan Ahmad. Roslan said a further “two factories with investment of RM200mil will be operational next year and another two in the final planning stage,” adding that Central Spectrum’s projects on Pulau Indah were slated to last until 2014. Central Spectrum is 76.7% owned by Kumpulan Hartanah Selangor Bhd and 23.3% by AMDB Bhd. Pulau Indah has also attracted a Belgium-based oleo chemical group, which is set to commission its RM72mil plant, covering 3.0ha, by March 2009. “This is our group first venture outside Europe. We chose Malaysia because it provides good access into China and US markets, as well as benefits from the currency exchange rate,” said managing director James de Caluwe. “Malaysia Development Industrial Authority has also approved a 10-year pioneer (tax incentive) status to our company,” he added. Meanwhile, the Selangor government has called on the Federal Government to speed up infrastructure works and public services facilities in Pulau Indah. “Make sure the construction of a second access to the island, the South Klang Valley Expressway, to be completed on schedule in 2012, as it is important to reduce road congestion and attract more investors into the island,” he said after a briefing by Central Spectrum. SINGAPORE: The Singapore government said it has acquired the property interests of a US-based firm in China and Japan for US$1.3 billion. Government investment firm GIC said in a statement late yesterday it will pay cash to acquire the property operations of US-based ProLogis in the two Asian countries. The transaction is due to be completed next month, it said. “The acquisition consolidates control over our existing portfolio in Japan and provides a platform to expand our logistics property business in China,” said Seek Ngee Huat, president of the firm’s property arm, GIC Real Estate. The Government of Singapore Investment Corporation (GIC) is one of two investment vehicles of the Singapore government and manages the country’s foreign reserves of more than US$100 billion through various investments. Its property arm, which currently ranks among the world’s top 10 real estate investment firms, has made over 200 investments in more than 30 countries. ProLogis, headquartered in Denver, is the world’s largest owner, manager and developer of distribution facilities with US$40 billion worth of real estate under its management, according to the company website.